Become a VITA Volunteer and Help Workers Save Millions. 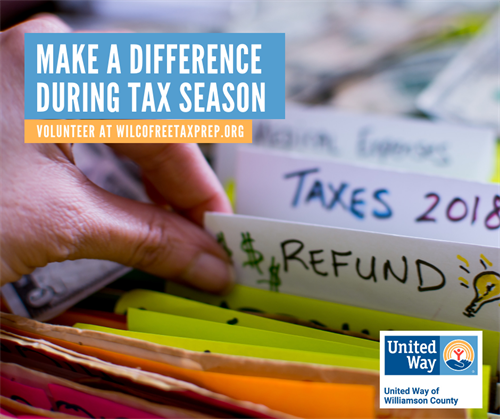 United Way of Williamson County is actively recruiting volunteer tax preparers, translators and greeters to provide free tax preparation assistance at VITA sites in Georgetown, Hutto, Leander and Taylor. You can be part of the team that helps over 3,000 low-to-moderate income households with free tax preparation services, resulting in more than $2.5 million in refunds returned to the local economy. Accounting experience is not needed. Training is provided. Bilingual preparers and translators are especially needed. Tax sites are open from late January through mid-April. For details, visit WilcoFreeTaxPrep.org or contact Nicole Foy at nicole@unitedway-wc.org or 512-255-6799. Training is in January. Tax preperation will take place from late January until mid April. It is free. We provide the training and certification and then volunteers will be able to help out the community.